NRI’s, come and bring your love once in Canada on Work Visa, Once in a life time opportunity! Indo-American astronaut Sunita Williams arrived here this morning from London. Sunita is on a weeklong visit to India and is eagerly looking forward to spend most of her time with her relatives. 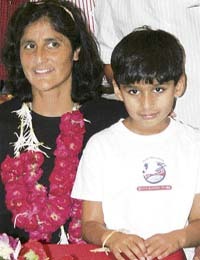 US astronaut Sunita Williams poses with her nephew Parth Pandya upon her arrival at a hotel in Ahmedabad on Thursday. She said every aim was achievable and that limitations existed in mind. The Army is now investigating allegations of irregularities in purchases made from funds released under the Army Commander’s special financial powers in Jammu and Kashmir. According to sources, tents and other ordnance equipment was purchased from local sources under the special funds. Can overburdened babus handle AIDS control programmes? Well, in India they can, even if they have no skill or time to give a push to the programme. Jaswinder Kaur daughter of Khajan Singh of Miani has refused to marry Army man Gurwinder Singh son of Lachhman Singh of Himatpur near Bhan Singh Di Kotli (Gurdaspur), as he had demanded a car in dowry. Soil in Punjab has become sleepy, lazy and even dead at certain places because of over exploitation and excessive use of harmful chemicals, including pesticides. “It needs healing,” says Peter Proctor, an international consultant on biodynamic agriculture, an advance form of organic farming which in simple terms is described as natural farming, free from the use of pesticides and chemicals.